Artabus : When did you begin painting ? A.B.C. 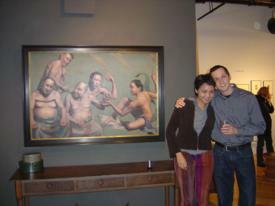 : While growing up my sister and I were always surrounded by art. Both of our parents were very open and artistic people. 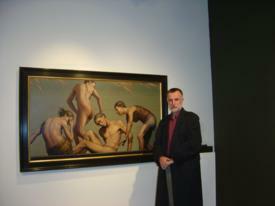 Particularly my father, he is a realist painter, sculpture and an art collector. As a consequence I was always encouraged to take art classes in various art centers and extra curriculum classes. I always like it doing it especially during the weekends when I had a lot of time, and I could watch my father do it too. I must admit that drawing and painting were always the favorite of all the art activities. The interesting fact is that I have never thought about painting as a carrier choice. To me art and making of art was something you relax with. Something that comes from the heart therefore it needs to be private. It can be sold but it can not be made commercially. For that reason I never considered myself to be a professional artist when I was a young boy. My father produced paintings only to give them away to friends and other family members. I always thought that everyone did it that way. So I was going to do the same. It was not until high school when my teacher Mrs. Gaglieardi asked me if I want to be an artist. Like the real ones. It was then that I thought of my art and self differently for the first time. She was the one who directed me to an art school here in the US. The rest is a history. As much as I guess I am a painter one thing has never changed, I still paint from my heart and only for myself.. (well I think I am getting a lot of help from some fine old masters from the late renaissance and baroque era) The only difference is that people buy my work, and I no longer give away a lot of art work. Artabus : Who were your masters, where do your influences come from ? A.B.C. : The list must include Tiepolo, Rubens, Caravaggio, Malchewski, Jordaens, Michelangelo, Gericault, .Delacroix, Van Dyck. To all those painters and other masters that are helping me, but I am forgetting their names, I am very sorry. Artabus : Movement in painting, where does it come from ? A.B.C. : I have always been intrigued by human bodies, especially the ones that are created in painting or sculpture. To me it is so remarkable that a human body with all its nuances can be recreated or created from the beginning by artist. When I saw paintings by my favorite painters/masters I was blown away. I was so impressed by their knowledge of the body and its form. I knew right then that this is what I need to do too. Not only was I interested in the human body because it offered a challenge to me but also because I can say so much with it. Human body can say so much more then any other “living being” can on this planet. This of course is my opinion. So by putting/arranging people in various positions I can create exactly what I need to convey in my painting. The movement in my paintings is a result of deliberate examination of what happens when a human body is experiencing certain switch from standing still. I am all about movement and expression of human existence. Human existence and human relationships are the main topics of my art. There is a need in my painting for a lot of action and may be even confusion and ambiguity , as human existence is all that and more. Artabus : How do you manage your success ? A.B.C. : There is a saying "the grass is greener on the other side of the fens." You know what I mean. The whole notion of artist success is overstated, and exaggerated. Successful artist struggle everyday, it is a lot more complicated then one thinks. Artabus : What are your objectives in term of future paintings and exhibitions ? A.B.C. : Well I just started a new series of paintings that are a bit different as the main action will be taking place in mid air. I am aping my figures air born. 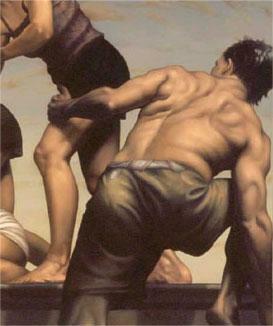 I thought that this will bring even more drama and action to the paintings making them more interesting and compelling. 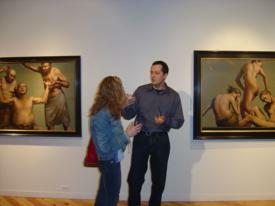 I will show them at the Ann Nathan Gallery in Chicago at the end of this year or begging of 2005. I will need to keep you up to date on that. Artabus : Thank you for your time, it was a great pleasure. A.B.C. : Thank you for the opportunity to share part of my life with you.